Arturo and Dre livecast and grade the NBA draft and Arturo grades every pick and every team. Arturo channels his inner Chad Ford and gives you an on the fly revision to correct the big man bias. Also included are Euro numbers and a scorecard to follow along at home! 2013 NBA Draft Extravaganza: The Worst Draft Ever! Arturo takes a deep look at the upcoming draft and what he finds is not at all pretty. Ari uses his new stat-based position adjustment to provide some analysis of the prospects in the 2013 NBA Draft. Our contest had some very good scores, but much like the NBA Finals, there was only one winner. Arturo talks about game six and how “most likely” does not equal 100% certainty. 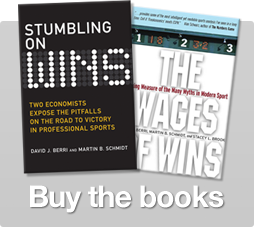 Dave Berri will be on Bloomberg Radio tomorrow at 1:15pm EST! Where does LeBron’s Amazing Game 6 Rank? Where does LeBron and Duncan’s game 6 showdown rank in the history of the finals? Dre looks into it.